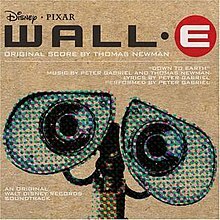 WALL•E: The Soundtrack is the soundtrack to the 2008 Disney-Pixar film of the same name. Released by Walt Disney Records on June 24, 2008, it was mainly composed by Thomas Newman and orchestration is credited to Carl Johnson, JAC Redford, Thomas Pasatieri, and Gary K. Thomas. Newman previously scored Finding Nemo (2003) and all other Pixar films have been scored by either Newman's cousin Randy, Michael Giacchino or Patrick Doyle. All tracks written by Thomas Newman, except where noted. The soundtrack won two Grammy Awards for Best Song Written for a Motion Picture, Television or Other Visual Media for "Down to Earth" and Best Instrumental Arrangement for "Define Dancing". It was also nominated for Best Score Soundtrack Album for a Motion Picture, Television or Other Visual Media. In addition, the soundtrack was nominated for two Academy Awards for Best Original Score and Best Original Song for "Down to Earth". ^ "WALL•E Soundtrack". Amazon.com. Retrieved 2008-07-13.